WITS » Last Chance to See Meta-Four Houston! Last Chance to See Meta-Four Houston! The Writers in the Schools Meta-Four Houston Team is performing in one last poetry slam, Veterans versus Newbies, before heading off to the Brave New Voices international competition in Chicago. Our team is the Texas Youth Poetry Slam 2013 State Champs! Come see them this Saturday, August 3, 2013, at the Alley Theatre–Neuhuas Stage, 615 Texas Avenue. 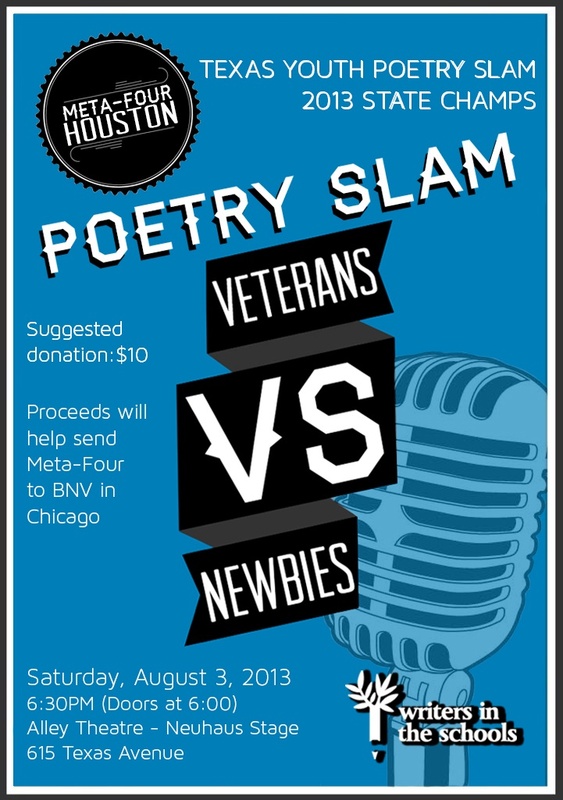 Suggested donation is $10 and proceeds will help send Meta-Four to Brave New Voices in Chicago. Doors open at 6 PM, and the slam starts at 6:30 PM.